Carrie Ann and I sitting outside of the White House on May 5, 2016. 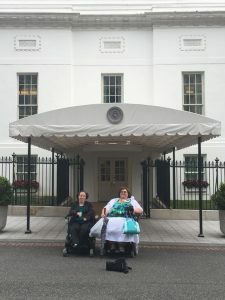 On Sunday, the disability community lost Carrie Ann Lucas, one of its fiercest members, and I lost a mentor, colleague, and above all, dear friend. Carrie Ann was a disabled mother, activist, and attorney. Carrie Ann died because of a broken health care system that does not value the lives of disabled people. Over the past year, Carrie Ann experienced a rapid decline in her health after her health insurer denied her needed medication. Had the insurer approved of this medicine, Carrie Ann would still be alive. This cannot be forgotten. I had the privilege to first meet Carrie Ann in 2011 while writing the National Council on Disability’s report, Rocking the Cradle: Ensuring the Rights of Parents with Disabilities and Their Children. Of course, I was well aware of her important advocacy long before then. Carrie Ann provided invaluable guidance to me throughout the writing of Rocking the Cradle, both sharing her personal story as a disabled mom and her professional experience as an attorney who represented disabled parents involved with the child welfare system. Over the past eight years, I have had the opportunity to work closely with Carrie Ann on matters related to the rights of disabled parents. Together, we conducted trainings across the country and consulted on many cases. Carrie Ann is single-handedly responsible for countless disabled parents being able to raise their families. As two of only a handful of attorneys that understood both child welfare and disability law, I treasured our time working together tremendously. To be sure, Carrie Ann’s brilliance far surpassed that of most (including me) and will be greatly missed. I am genuinely grateful for the wisdom she imparted on me, and while I will never be nearly as knowledgeable as Carrie Ann was, I do hope to do my part to make sure her legacy continues. Although I valued Carrie Ann as a mentor and colleague greatly, it was her friendship that meant the most to me. While we did not get to see each other often, I always looked forward to catching up with her. I also loved receiving her annual Christmas cards. I last saw Carrie Ann in the Fall when we presented together at a conference. After our presentation, we visited together, chatting about our lives. Carrie Ann, of course, gushed about her family. We discussed her amazing purple hair. She also told me about her declining health and her plan to spend 2019 fighting to improve the health care system, so no one else had to experience what she did. My greatest regret is not knowing it would be the last time we would see each other. Had I known that, I would have told her just how much I looked up to her and how thankful I was for her friendship. As a woman with a significant disability, I looked up to Carrie Ann and the life she created, especially as a disabled mom. Carrie Ann paved the way for people like me to be parents. I have always intended to have children, and like most disabled people, have met significant resistance. However, it was because of Carrie Ann that I knew it was possible. Carrie Ann was an amazing and committed mother who would do anything for her children. If I am half the mother she was, I will know I have succeeded. Sadly, I will never be able to get advice from Carrie Ann when I become a mother. However, many disabled parents were able to receive Carrie Ann’s wisdom, and her knowledge will live on in others. I find peace in knowing this. Carrie Ann was the epitome of greatness. She fought the good fight, always seeking to eradicate injustices. While she knew there was much to be done, Carrie Ann did not let this lessen her drive. If anything, it made her even more motivated. Carrie Ann left the world a better place, and I will be forever grateful to her. Thank you, Carrie Ann, for everything you did for the disability community and for me. I will never forget you and am committed to ensuring your legacy endures.